nice pic .i am biggest fan of pti and ik. The name of his son Sulaiman Isa Khan seems weird to me. Sulaiman and Isa they are two names and then Khan in the end makes it more lengthy. son of imran khan are very cute Thank God they dont look like their father, Imran Khan is not handsome he does not look cool as if his sons. imran khan sons are very cute imran khan was also very cute but now he look like chines budha.. he should not shave he should keep beard it may look good on him. Now we are waiting for Imran and Reham Khan Son pictures May Allah give them a Cute little baby ... the naya baby for naya pakistan. 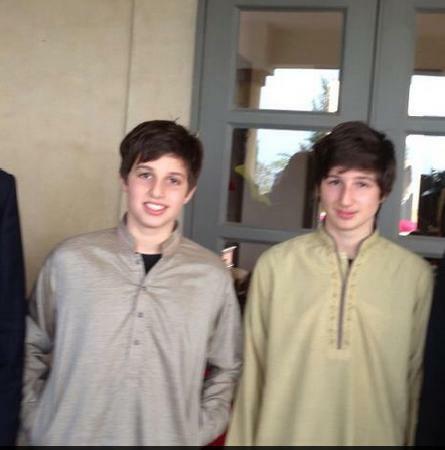 This is very old pic of imran khan sons now both are grown up his elder son is doing graduation and i think. Soo sweet and cute May ALlah bless them with lot of treasure of protection . Imran khan must be given a chance to rule pakistan but recommendation is he needs to be more prfessionly mature in politics n needs to b e careful and show patience before he comments .Best wishes imran khan! Thank God these kids are growing up in the UK! They wont become terrorists and start blowing things up. Thank God! May Allah protect imran khan. i love imran khan sab . I love pti . Humri duaye apky sath hain khan sahb. Um.. Who's qasim and who's suleiman? may them live long and kept them on Islam. Beautiful Kids but they live with their Mother and her boyfriend Hugh grant with whom they also share fun. Very Pity. i like what imran khan said in her last speech at Peshawar what his sons can not be the chairman of pti if they get any of big seat in pti he will left pti..love u imran khan..